The trophy wife of a brutish Russian-Israeli oligarch falls for a charming Arab taxi driver and the two elope to Gaza. Some time later, her kids are gone, snatched off the street by Bedouin thugs-for-hire. Dame wants her kids back and has the credits to make your time worthwhile. Classic story. First question to pop into your head -- are you willing to brave the radioactive Negev desert and the bio-horrors it spawned, the Israeli border patrol with its drones and bots, and the Russian Mafia with its Russian Mafia? Sure you are, that's all in the freaking job description. But then, there's a second question ringing in your brain -- on whose toes you gonna step if you take this job? Why are Israeli drones always buzzing above? What game is the Russian FSB playing? And who invited the Kurds for the party? 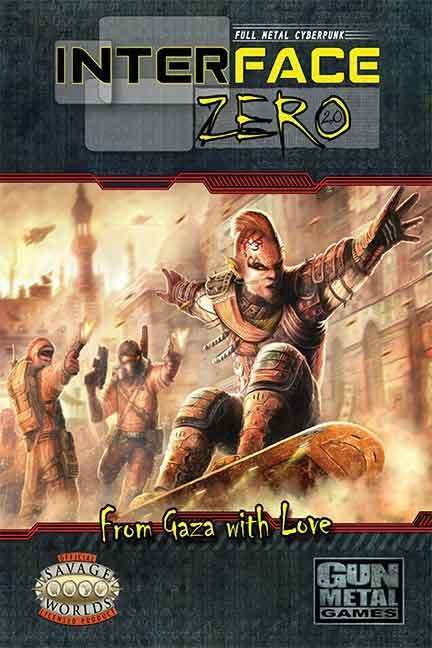 From gaza with Love is an adventure for 3 to 5 players. This E-book comes in a layered screen version, and a flattened version for E-readers such as an Ipad or Kindle. Any chance to see these adventures converted to FATE? Everything has been going slow, but yeah I want to eventually port everything over to Fate. I don't know, care to elaborate?